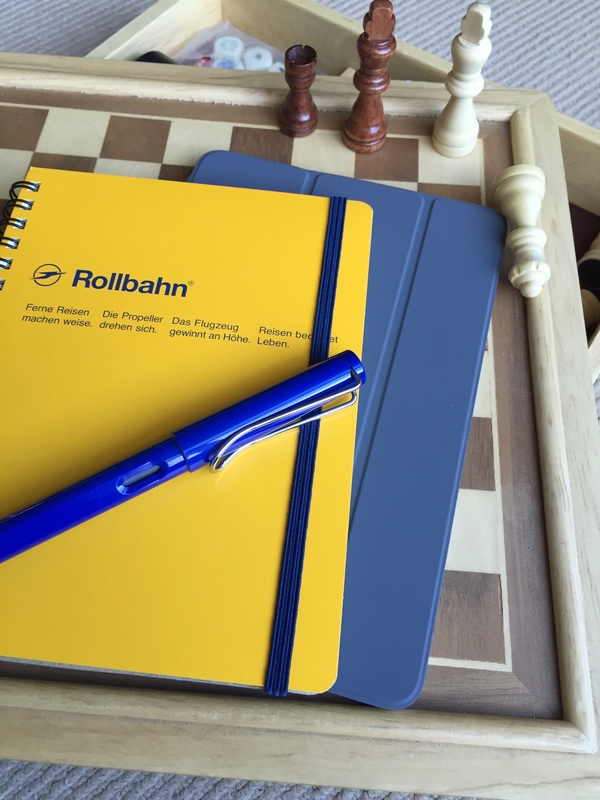 In my ongoing quest for a quality spiral bound notebook, I decided to pick up a Delfonics Rollbahn recently, during a free postage promotion on Notemaker, one of Australia’s best online stationery stores. Since then, I have also seen new stock arrive at the Dymocks Brisbane CBD bookstore, and the Rollbahn metallic covers (silver, gold) look absolutely fantastic. How do they perform? The most apt description here is also fantastic, and I have put together a few thoughts on this below. The particular model purchased was the large (14 x 18 cm or 5.5 x 7 inches), which is a little more square in form than say, an equivalently sized Moleskine, which measures 13 x 21 cm (5 x 8 inches). I must admit, I do like the square format of the pages, as my writing is often not on the small side when jotting down a few quick notes, a list, or even something a little longer. Looking more closely at the design, the binding is double spiral for added strength, with the cover made of extremely stiff, robust semi-gloss card stock (also described in the product specifications as splash-proof, however I did not specifically test this). 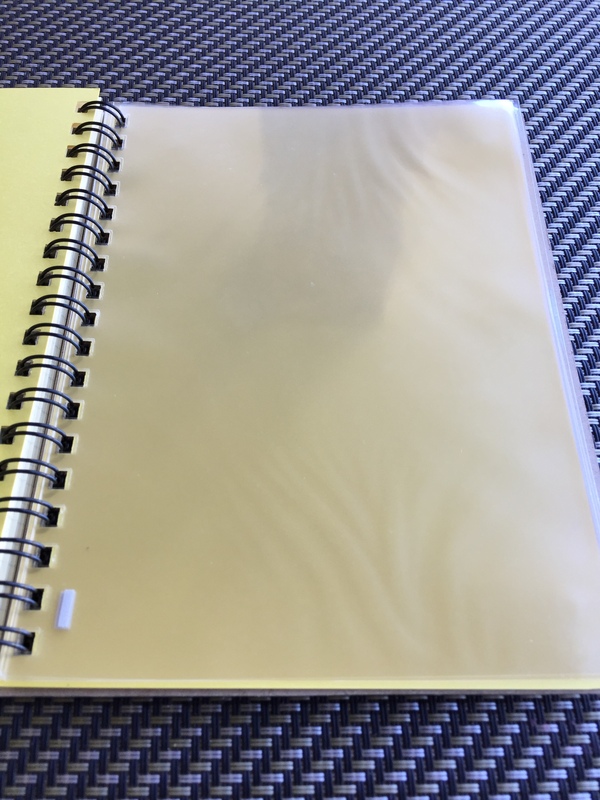 At the rear of the notebook are five, top-opening, clear plastic sleeves between two thick yellow dividers matching the front cover. As with the front, thick card stock forms the back cover — this time in kraft, complete with a small letter-pressed Delfonics branding. An elastic closure strap in navy blue (matching the contrasting logo on the front cover) completes the picture. The overall look of these notebooks is quite striking, and I am quite drawn to the styling, quality and attention to detail applied to both the design and manufacture — not surprising given two factors: it is stationery, and it is made in Japan. As I mentioned earlier, the silver and gold metallic covers are even more impressive, and nothing can beat seeing them first hand in a store. In fact, I have no doubt my accompanying photos would have been of the silver model had I seen them in-store prior to my online order. As far as I am aware, the Rollbahn series come in 5 x 5 mm graph paper only, however the rulings are so faint I did not find it dramatically different to a dot grid type of paper, nor should those who find graph ruling a little “busy” for their tastes. At the very least it is worth a look, even if graph ruling is not your thing. All sizes in the Rollbahn series contain 180 pages (90 sheets), with every page perforated for easy removal, however a little care is required when initiating the tear. I would note here I am always loathe to criticise a notebook for this, as my technique can be a little, how shall we say — “cumbersome”, at times. 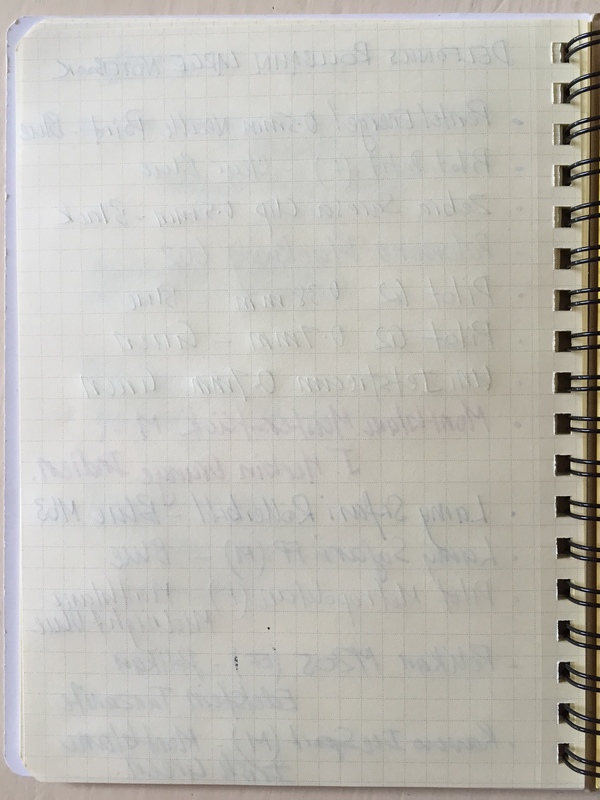 Of course the best design components of a notebook pale significantly if the paper is not up to expectations. A note here about the paper first up. It is yellow. Pale yellow, however yellow nonetheless. 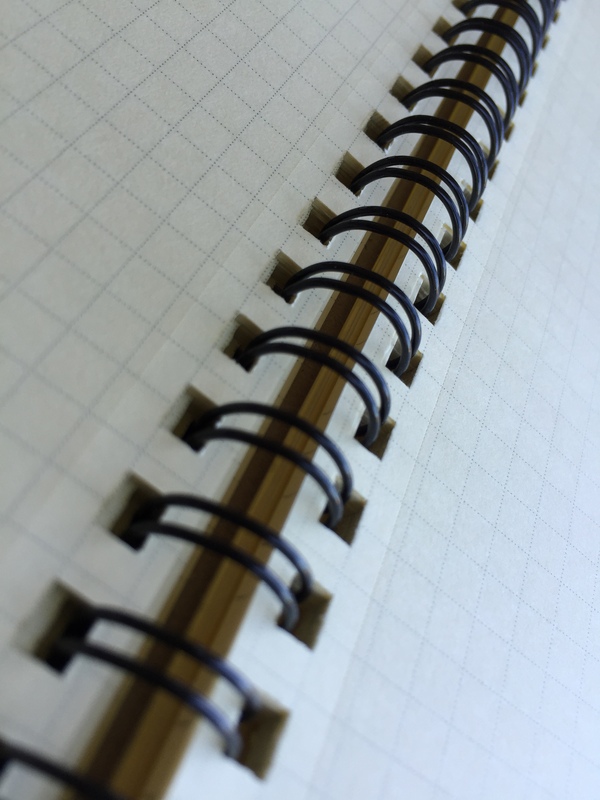 The specifications on Notemaker describe the paper as “off white/ivory” with “brown/grey” coloured ruling for the 5 x 5 mm graph paper design. Is the paper colour a deal breaker? I’d say no, however if you are someone who uses a lot of subtle colours or shades of inks, it just might be. Just to confirm — it’s definitely yellow. There is no way I can be convinced this is merely off white or ivory, and if the performance of this paper were not as good as what it is, I may not have enjoyed using it as much as I did. I simply prefer paper towards the whiter end of the spectrum — particularly for those types of inks. That said, upon putting down some samples on a page, (see accompanying image above) most of my comments above might appear unwarranted or a little harsh — comments which I almost removed (the sample page being written after drafting the post). More vibrant, colours such as Montblanc Irish Green and J.Herbin Orange Indien were fairly true to their white paper appearance (the orange perhaps losing a fraction of nuance), however I have also added a shot below of some Montblanc Daniel Defoe Palm Green, where most of the green tones can only be seen in a smudge. Conversely, I have found a nice, consistent shade of earthy green when the same ink is used on whiter paper. See for yourself in the accompanying images, and the only reason I highlight this aspect in particular, is that for me, were this paper white, I would be telling you it would be pretty much perfect. It is that good. The usual characteristics such as bleed through, show through or feathering are handled perfectly by the 70gsm paper — that is, pretty well none of these are demonstrated in the writing I have put down so far. 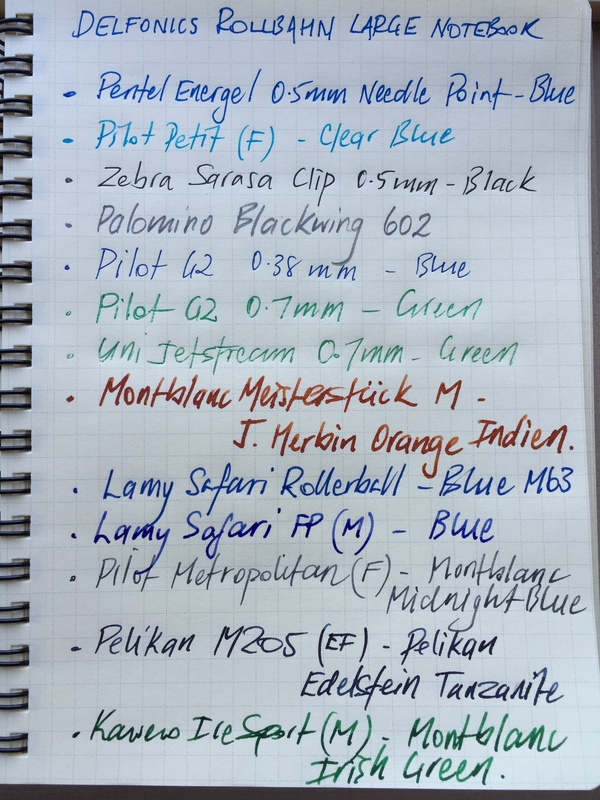 This is great paper for note taking — fountain pens included, with dry time certainly on the quicker end of the scale compared with other brands of paper. I find it a little less “slippery” for want of a better word than say Rhodia paper, my go to for fountain pens typically. The little bit of extra feedback suits my writing style perfectly, as I sometimes find a really smooth nib more difficult to control on very smooth (e.g. Rhodia) paper. One minor qualm I noted when writing was the small amount of “wiggle” or movement of the page if not held with your opposite hand, mainly due to the large squares cut in the paper for the double spiral binding. Most likely not a problem in the extra-large size, however in a notebook of this size, I often rest my hand on the left page or off the notebook completely. Not a major issue however the movement was noticeable and something I thought worth mentioning. 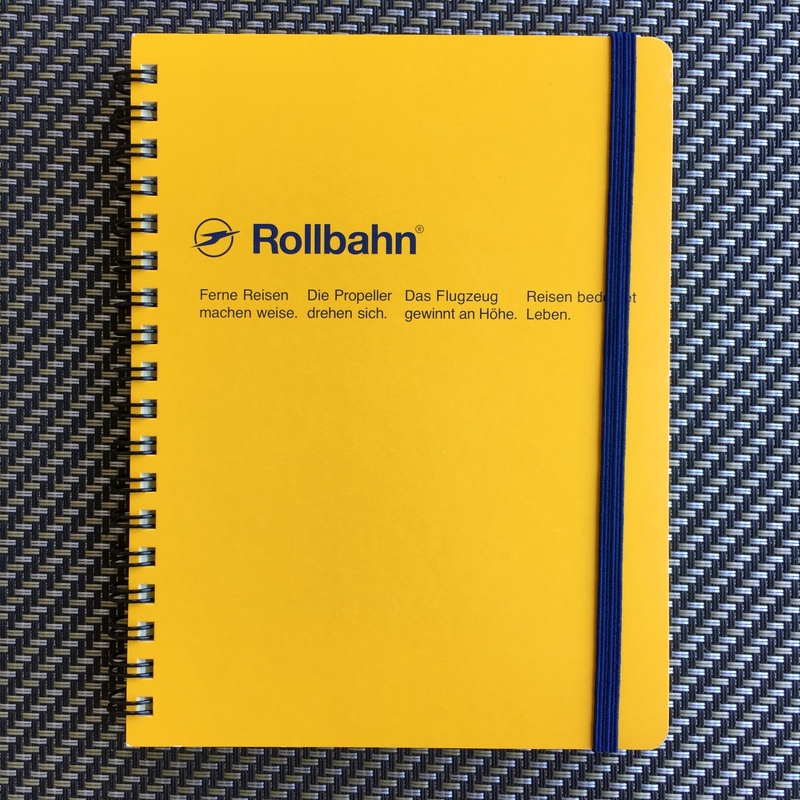 For me, this large size notebook — my first Rollbahn, is best suited to shorter note taking given the size of the pages, however would hold up well for longer form writing. In a larger size, I can see this working extremely well as an office meeting note taker or “day book” of sorts, which is where I find the spiral bound books to work best for me. Many of the notes I take during the day relate to meetings, general thoughts/ideas on processes, procedures or projects, and rough working, mind mapping or outlining these very topics. Why does the spiral binding suit here? Simply because I prefer a notebook at work which opens flat, closes flat, and can be turned back on itself to allow notes to be taken on a somewhat stable and rigid surface if I choose to rest the book on my lap. This I find to be a common scenario, either for comfort reasons in a long meeting, or to jot down a few confidential notes, where the notebook is angled towards, and closer to me. It is also at my office job I am most likely to be using ink colours in the blue-black spectrum, or more gel ink pens or my trusty Retro 51. 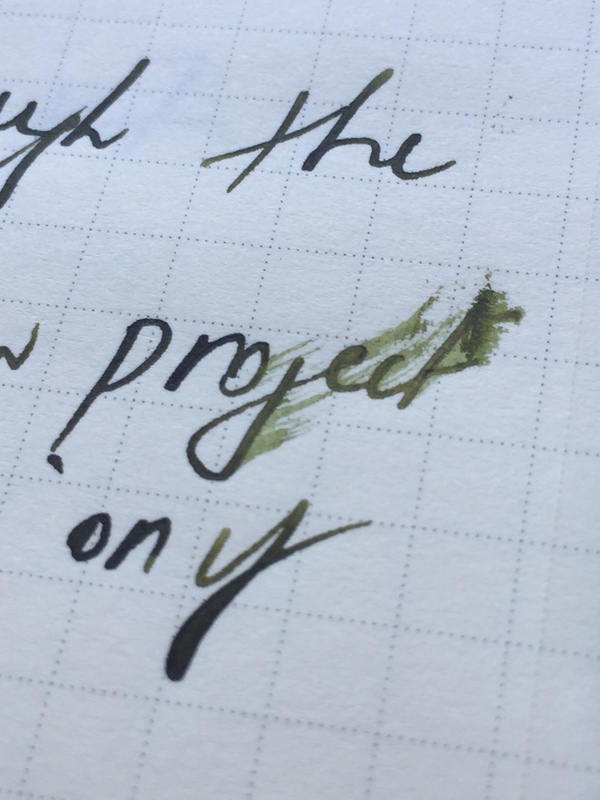 As good as the paper is, as I’ve state above, the yellow shade is probably not best for testing your new ink colours — at least those on the subtle shade side in any event. My purchase receipt tells me I bought this notebook in late October, and in the intervening two months, I have: made a few plot related notes for NaNoWriMo; jotted down some coffee tasting notes; written a few pages worth of outline for a post on what I learned from NaNoWriMo (must actually finish and publish that one! ); and taken a dozen or so pages of notes whilst watching David Sparks excellent OmniFocus Video Field Guide (in Daniel Defoe Palm Green – see accompanying image). 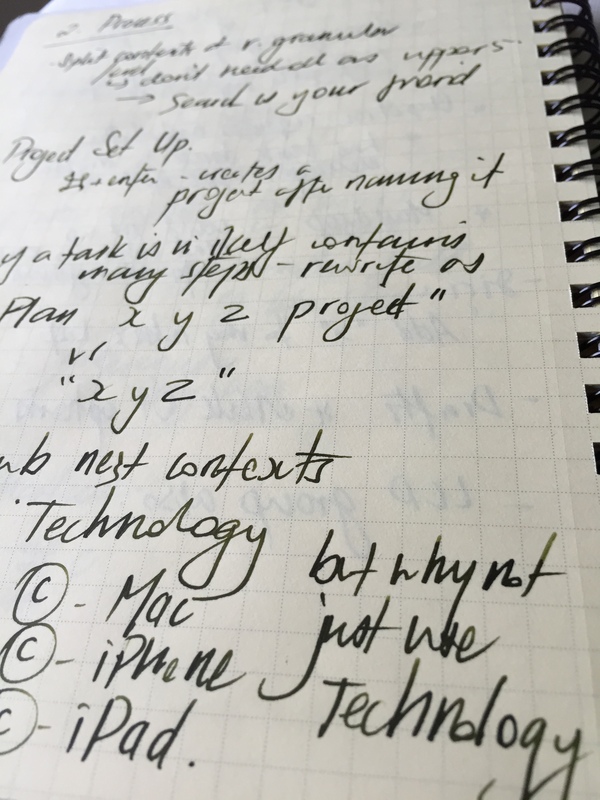 A group of notes largely consisting of bullet points, lists and short text notes. It is pretty clear I am very impressed with the Delfonics Rollbahn, and find it suits my style of writing and notebook requirements extremely well. The styling, design and build quality are second to none. I will definitely be giving the extra-large size a run as my office notebook in future. What do I like most? 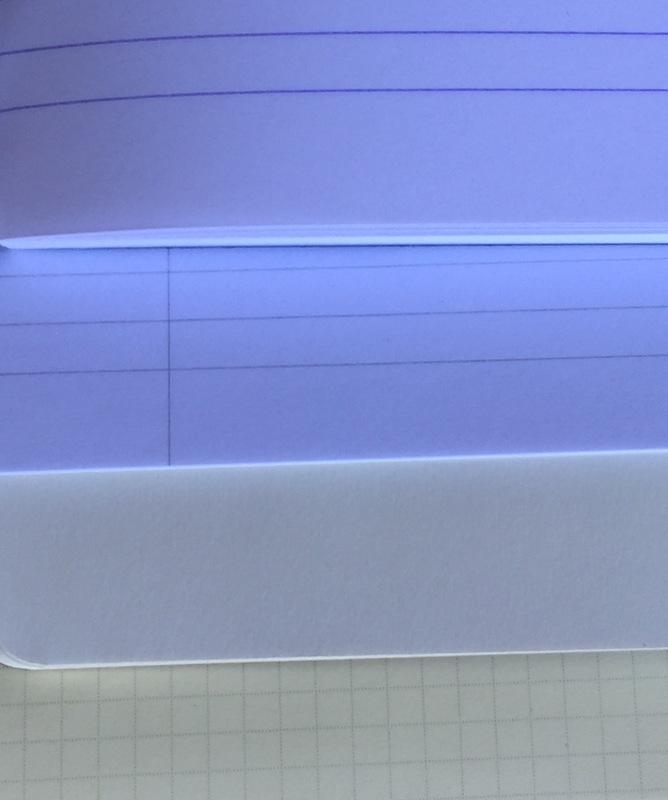 Definitely the paper quality, (if not quite the colour), the overall build quality and design, and the attention to detail that is apparent in the double spiral binding, rear pockets, and perfectly rounded corners. Although nice, the closure strap is something I generally prefer not to have (particularly in a notebook which closes well on its own) — as I find they often get in the way. Certainly not a deal breaker by any stretch. My dislikes? Here it is really only the shade of the paper, for otherwise it is essentially flawless. A minor qualm about the “wiggle” in the page when writing I mentioned earlier is not something which would stop me buying more in the future. As far as value for money is concerned, here is where things get a little (not a lot — but certainly a little, depending on your budget) interesting. The 14 x 18 cm sized notebook retails for $AU14.95 (either brick and mortar store or online), and the extra-large 19 x 26 cm for $AU24.95. Not an insignificant amount, however when balancing this with what you get for your money, that is, exceptional quality, and 180 pages of it, I’d say the value for money certainly is definitely there. I should also mention the notebook also comes in a smaller (10 x 15 cm), 180 page top opening reporter style notebook for $AU9.95. 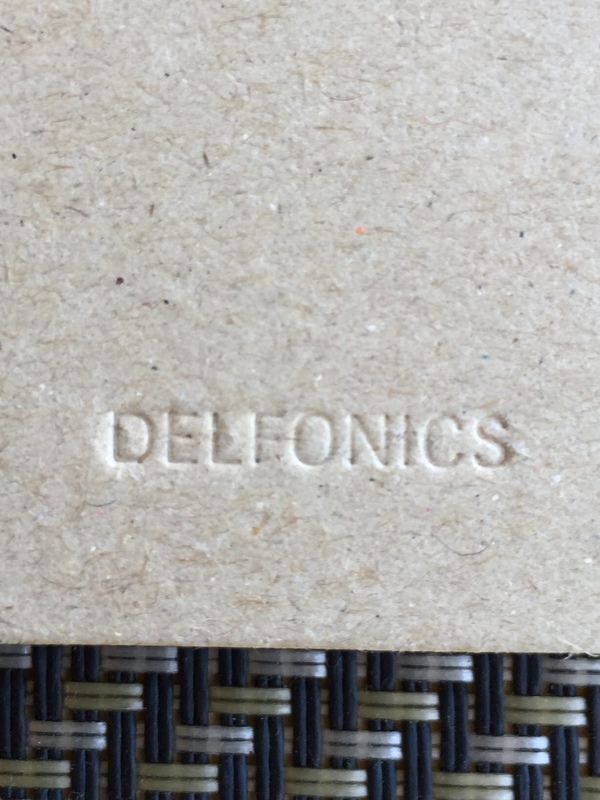 Although this is my first Delfonics Rollbahn notebook, I doubt it will be my last. My recommendation would be to try one for yourself, and if you write with fountain pens, my advice is the same — try one out. Just remember, though perfectly fine for most colours, the shade of paper isn’t made to showcase the subtleties of your ink collection, but will serve you extremely well for taking meeting notes or writing the intro or outline to your next long form essay.